Wedding Videographer for Karen and Brian – 28’th December 2011. 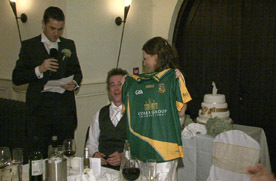 I was the wedding videographer at the wedding of Karen and Brian on Wednesday the 28th of December of 2011. When I arrived at the church of The Holy Sprit in Aughrim Fr. Michael Cody was the Celebrant, he did a lovely mass and was very relaxed and made everyone feel very welcome. 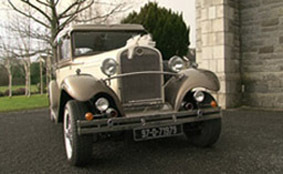 Karen arrived in a Beauford from ATT chauffeursonline, it really is a beautiful car. The church music was lovely and was provided by Stella, she was accompanied by a family friend called Johnny Carney. They were just brilliant and added a lovely touch to the ceremony. Jullie Cummins and Aileen were the wedding photographers on the day and they got some great shots. When we arrived at Brooklodge the staff as usual were so competent and professional, the way they look after a wedding is second to none. The guests mingled in the Brook Hall and were entertained by none other than Derek Keys, he is a swing singer and is excellent. That evening we had a band that I had not come across before but were really fabulous, they were called Soul Purpose and they got the crowd up and dancing. 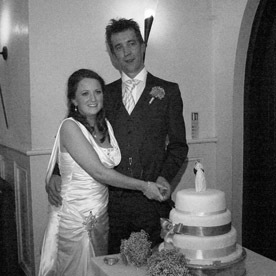 I will be in contact soon regarding your wedding DVD’s.